Finacial aid to religious schools was at issue in Everson (1947), widely considered the Court's first "modern" Establishment Clause case. In Everson, the Court narrowly upheld a law providing reimbursement of the costs for bus transportation to the parents of parochial school children. The Court stressed that the aid went to parents, not directly to religious schools. Similarly, in Bd. of Educ. v Allen (1968), the Court upheld a law loaning textbooks free of charge to the students in private schools, again pointing out "no funds or books are furnished to the parochial schools, and the financial aid is to parents and children, not schools." When aid went directly to religious schools, the Court took a harsher view. In Lemon v Kurtzman (1971), the case giving rise to the famous three-part "Lemon" test that would find application in decades of establishment clause cases, the Court struck down a law reimbursing nonpublic schools for portions of teachers' salaries and instructional materials. In 1985, in Aguilar v Felton, the Court found that sending government-paid teachers into parochial schools to provide remedial education violated the establishment clause, as the program "excessively entangled" state and religion. But then, just 12 years later, in Agostini v Felton, the Court (reflecting a more lenient approach in Establishment Clause jurisprudence) reversed course and overruled Aguilar, upholding the practice of providing the services of government-paid guidance counselors on the premises of sectarian schools. The Court saw neither advancement of religion through government indoctrination nor the type of "pervasive monitoring" to avoid religious inculcation that would constitute "excessive entanglement." 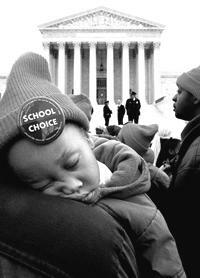 In 2002, in Zelman v Simmons-Harris, the Court weighed in on the controversial issue of vouchers. Under consideration was an Ohio program that provided financial assistance (in the form of tuition aid) to parents of private school children in the Cleveland City School District. The aid was based on parents' financial need. Even though over 90% of the financial aid went to parents with students in religious--as opposed to non-sectarian private--schools, the Court, by a 5 to 4 vote, found the program did not violate the Establishment Clause. Writing for the Court, Chief Justice Rehnquist emphasized that the program was neutral with respect to religion, thus making it "not readily subject to challenge under the Establishment Clause." Whatever "incidental advancement of a religious mission" that might come from the voucher program was "attributable to the individual recipient, not the government." 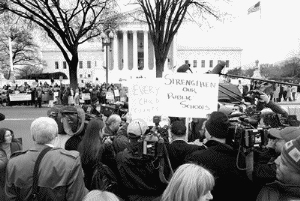 Dissenters stressed that the voucher provisions were "skewed toward benefitting religious schools" and "risked creating a form of religiously based conflict harmful to the Nation's social fabric." In 2011, in Arizona Christian School Tuition Organization v Winn, the Court considered an Arizona law that extended tax credits of up to $1000 per couple for contributions to private school tuition organizations. The organizations used the contributions to provide scholarships to attend private schools, the vast majority of which were religious schools. Writing for a 5 to 4 majority, Justice Kennedy found that the plaintiffs, suing as taxpayers, lacked standing. Accepting that Flast v Cohen allowed taxpayers to challenge governmental appropriations that allegedly contravened the Establishment Clause (creating an exception to the general rule of "no taxpayer standing"), the Court distinguished tax credits from appropriations. Kennedy noted that a "dissenter whose tax dollars are 'extracted and spent' knows that he has in some small measure been made to contribute to an establishment in violation of conscience," whereas in the case of tax credits, a taxpayer's connection with the establishment depends on "economic speculation" and "political conjecture." Writing for four dissenters, Justice Kagan argued that appropriations and tax subsidies "are interchangeable" and that the Court's decision provided "a roadmap" for any government that wants to "insulate its government funding of religious activity from legal challenge." 1. Would a voucher program be constitutional in a district where there were no private, non-religious schools? What if 49 of the private schools in the jurisdiction were religious, and only one was not? 2. Would a voucher program be constitutional if lawmakers supporting the program argued, "This is a good way of getting more kids into schools with religious training, and that's a good thing"? 3. Would direct government aid to all private schools, as opposed to a voucher program, be likely to be upheld after Zelman? Why or why not? 4. Would a voucher program for private colleges be constitutional? Are there reasons for possibly treating a program that aids private college students differently than one that aids private elementary or secondary school students? 5. Should it be constitutional to exempt church property from the payment of real estate taxes, a common practice? Such exemptions were upheld by the Court in Walz v Tax Commission of New York (1970).